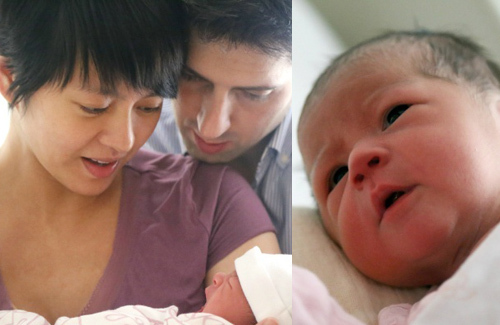 First-time mother Gigi Leung (梁詠琪) has been thrilled since the moment she held newborn daughter Sofia. The baby girl was nicknamed “Little Princess” due to her adorable looks, a mixture of Gigi and father Sergio Crespo Gutes‘s best features. Measuring over 19 inches tall at birth, Sofia also inherited her parents’ long legs. Slowing down her work schedule in the past three years to prepare for motherhood, Gigi was ecstatic when she discovered she was pregnant last year. Although Gigi endured a lot of discomfort during her first pregnancy as well as painful labor, she said all the sacrifices were worth it. Such delicate features! Sofia is really cute! I’m am so happy for this couple! My most favorite couple ever! very beautiful baby. the labour is all worth it. Really cute baby wonder what her Chinese name will be. What’s wrong with a mixed baby? There are a lot of people who are of a mixed race and turn out to be a great person. Karen Mok and Sonjia Kwok are mixed and I don’t see anyone rejecting them. And it seems like you dislike a lot of people because of someone who is a mixed background. What a pity. What does having an English name have anything to do with being biracial? Almost like saying, if you don’t like Asian people, then don’t use fireworks, paper money, compass, since they’re all invented by the Chinese. Yea what wrong with mixed individuals? I find them to be beautiful and exotic-looking. Gigi already had a baby. Why about best friend Charlie Yeung? Both are good actresses and humble. I like their acting and also their down to earth personal life. How come no one commented on how fugly the guy is? Oh right…he’s white, so he’s alright. Just contrasting the amount of people posting similar comments as mine when discussing Wong Cho Lam and Leanne Li to none here. Wong Cho Lam got many fugly comments vs this white guy who got one. That’s ugly? Please, you’re too ashamed to show your own face. Your jealousy is showing. I think Asians (less so in HK), but particularly Japanese, Thais and Filipinos, tend to look up to/idolize whites too much – if you’re white, you’re alright. Hence, the popularity of sexpats to many Asian countries. ok no offense but babies are often really ugly for the first month or so until their wrinkles fills in. hate me if you want, but i find it true in many cases. I agree. First born babies are usually not very attractive until a few months later when they start to develop and you see more of their features. Sofia is super cute and the name match her very well! Super happy for the two of them!! !